If I were ever to go on Mastermind, my specialist subject would be Columbo. In how many episodes has Patrick McGoohan guest starred? (four, but he directed five episodes). How does Columbo trick a confession from Dale Kingston in Suitable for Framing? (wears gloves in the final scene when fingerprints are found on the Degas pastels). What is the name of Ricardo Montalban’s bull-ranch in A Matter of Honor? (The Montoya Ranch). But I’d save a special effort for the murderous ladies of Los Angeles, the immaculately dressed but deadly femmes who, with an arched eyebrow and a swish of nylon, provide the perfect foil to Columbo’s crumpled mac. Top of my list would be Lee Grant in Ransom for a Dead Man. She’s cool, dismissive and one of the first women on television to play a traditionally male role – the interesting thing about this episode, only the second ever made, is that her character Leslie Williams is as successful as her husband, and the gender roles could easily be swapped without changing the essence of the story. Lee Grant is wonderfully dry and controlled, smartly batting away the Lieutenant’s awkward questions. She’s also a masterclass in mid-seventies style – no-one rocks a violet polyester jumpsuit with quite as much panache, and you can almost smell the Madame Rochas as she turns round to fix Columbo with a withering glare. 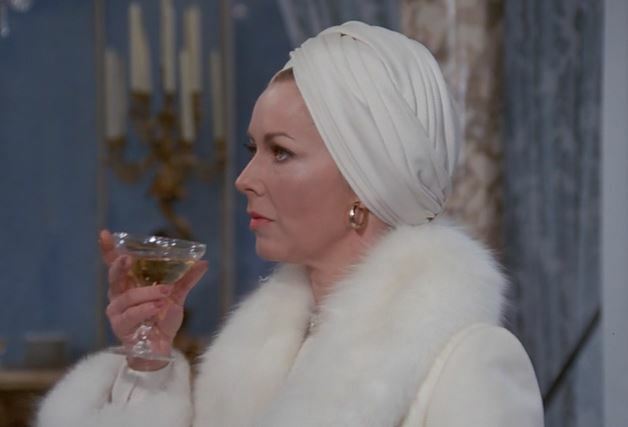 Vera Miles in Lovely But Lethal is cut from a similar cloth. A Helena Rubenstein figure, she’s the head of Beauty Mark, whose recipe for a miracle wrinkle cream is swiped by Martin Sheen. He promptly gets bashed on the head with a microscope by Viveca, before he can sell it to her arch-rival, Vincent Price. Vera’s character, Viveca Scott, is the embodiment of Rubenstein’s mantra ‘there are no ugly women, only lazy ones’ and the first time we meet her, she’s swathed in fur and jewels, sipping champagne and enjoying the kind of catwalk fashion show you only ever see in a seventies detective drama. She’s ruthless, impatient and utterly focused, and has nothing but contempt for the men who get in her way. 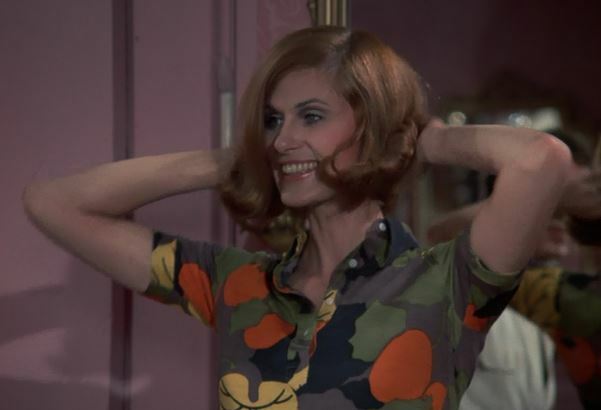 Lady in Waiting presents a different type of female character – Beth Chadwick (played by Susan Clark) has meticulously planned the murder of her overbearing brother to escape his control and marry her dashing fiance Peter (Leslie Nielsen in one of his two Columbo appearances). Once Beth has bumped off her brother, she undergoes a bit of a makeover- she buys a cobalt blue sports car and transforms herself from frump to fabulous at a Beverly Hills salon. The revelation comes as a bit of a shock to Peter, who seemed to prefer her when she was beige and unthreatening, but Beth is now an independent woman, and takes over the family business. However, she’s undone by her own overconfidence and a missing lightbulb. Columbo is a visual feast – everywhere the eye lingers, there is something amazing to see. From Robert Culp’s beachside home in Death Lends a Hand to Gena Rowlands’ marabou trimmed housecoat in Playback, it’s a stunning time capsule of retro cool.